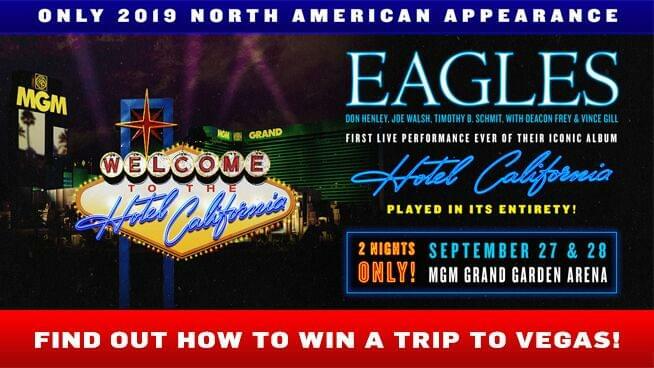 Enter for a chance to win two (2) tickets to see the Eagles perform “Hotel California” in its entirety on 9/27/19 at the MGM Grand Garden Arena in Las Vegas, plus a two (2) night hotel stay at the MGM Grand (9/27/19 – 9/29/19) and two (2) round trip plane tickets from the Bay Area to Las Vegas! Furnished by Live Nation and the MGM Grand. Contest ends 5/5/19 @ 11:59pm. One (1) entry per person. One (1) winner will be awarded. Retail value: $2,500.00. For the first time ever, the Eagles will perform their “Hotel California” album live in its entirety on Friday, September 27th and Saturday, September 28th (2 nights only) at the MGM Grand Garden Arena in Las Vegas! For the first time ever, the Eagles – Don Henley, Joe Walsh and Timothy B. Schmit, with Deacon Frey and Vince Gill – will perform their iconic album “Hotel California” in its entirety in their only North American performances of 2019. Each night’s concert – Friday, September 27, 2019 and Saturday, September 28, 2019 at MGM Grand Garden Arena in Las Vegas, Nevada – will also include an additional set of the band’s greatest hits. The shows are scheduled to begin at 8 PM. Tickets starting at $179 (not including applicable service charges or fees) go on sale to the general public on Friday, April 12, at 10 AM PDT through Ticketmaster.com. ﻿Your browser does not support iframes. Please visit http://1077thebone.listenernetwork.com/Contest/2XIHFY.